If you’re at the cutting edge of CPG supply and demand, you know all about balancing consumer tastes and market forces with the reality of ROI. When it comes to packaging, you need to source the right skills at the right time to ensure a smooth transition from concept to shelf in the shortest possible timeframe. At Creative Edge Software we believe we offer the unique capability – in iC3D – to tackle head-on the issues you face. Whether your products require carton, glass, cans, flexible packaging, labels or shrink-wraps, iC3D produces fast, accurate and photorealistic 3D visuals and prototypes on-the-fly, and ready for print. The iC3D all-in-one package allows your designers to give full rein to their creative instincts and allows you to innovate with your brand. It offers the tools and the opportunity to review, bench test, troubleshoot and refine, to get timely buy-in from stakeholders and market. The results speak for themselves: our users report getting their new packaging designs to market up to 80% faster. Create 3D models and visualize products as your customers would see them on store shelves, gondolas or in chiller cabinets, in daylight, dim light and fluorescent light. 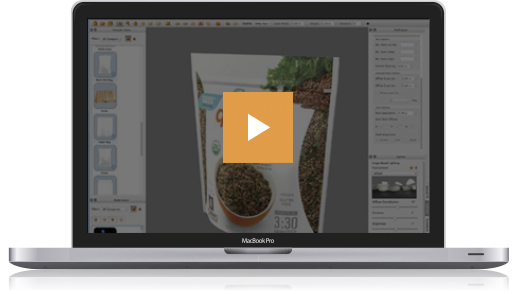 iC3D makes collaboration easy with a free web viewer and cloud storage, opsis. Results can also be shared as 3D visuals, press-ready proofs, animated movies, or even printed out in 3D. No specialist programs, hardware, or outside assistance, just a single application using a simple Illustrator file or PDF for photorealistic results in minutes.